Daniel Craig's time as James Bond is over. There's been no official word that his stint as 007 is finished, but with each passing day it's looking less and less like he's going to continue. After apparently saying no to a huge pile of cash for two more movies, Craig's vacated spot as the suavest spy in cinematic history won't sit empty for long. We've heard the fancasters cry out for Idris, yet it's looking like it'll be a close race between two candidates: Fantastic Four's Jamie Bell and.... LOKI! Tom Hiddleston, to be precise. News of Bell entering the mix comes from Deadline, who say he's reportedly sat down with long-time Bond producer Barbara Broccoli to discuss the part. That's the extent of the site's knowledge on Bell's involvement. However, it sounds like Hiddleston is no longer just a fan favorite, but a bona fide contender for the part. Birth.Movies.Death reports that the Marvel villain is in "advanced talks" for the role, adding that those chats have indeed taken place, Hiddleston's keen as mustard, BUT "no official offer has been made - yet." There's several ways that we could take this. The site points out Hollywood has a habit of courting actors they really want for parts by publicising the fact that other thesps are *this close* to signing on. It's an odd way of doing business, for sure, and if true makes you wonder who they're actually eyeing for the part. 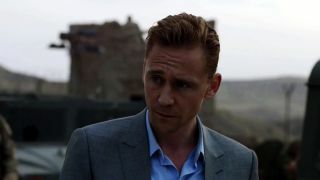 On the other hand, Hiddleston could absolutely be in contention for the role, and is just ironing out the details. He's more than proved himself capable as a strong lead and dastardly supporting player. Can we get an official confirmation please Sony?